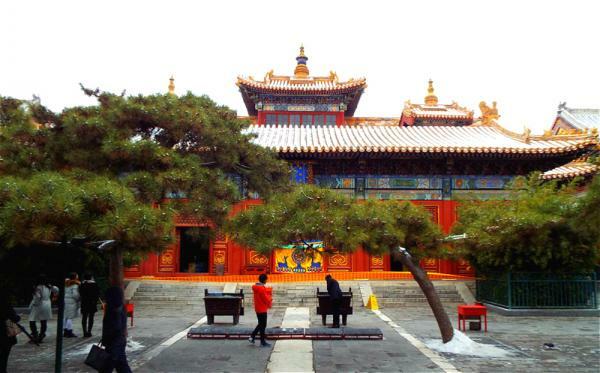 Yonghe Lamasery (Yonghegong / Palace of Peace and Harmony) - a Tibetan Buddhist temple in the northeast corner of Beijing, which was first built in 1694 as the residence of Prince Yong of the Qing dynasty. 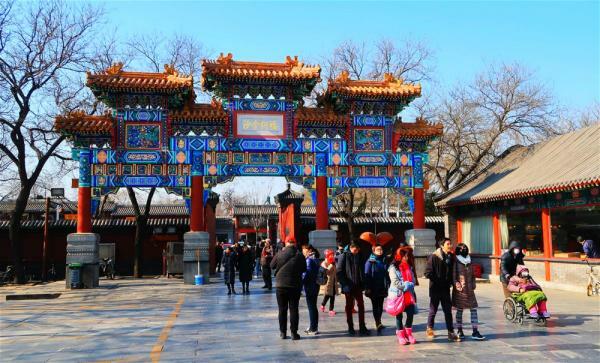 After Prince Yong ascended the throne as the Yongzheng Emperor, he changed this residence into a temporary imperial palace in 1725. After he died in 1735, his coffin was placed here. As a former imperial residence, the green roof tiles in the compound were replaced with yellow ones. 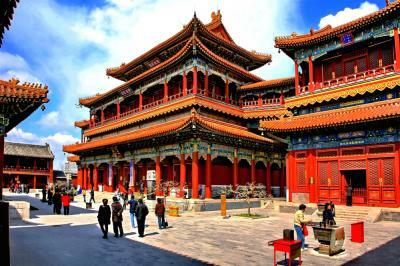 And then, the successive emperor – Qianlong Emperor gave the residence imperial status signified by the same specifications as the Forbidden City, and sent for large numbers of Tibetan Buddhist monks and housed them here in 1744. 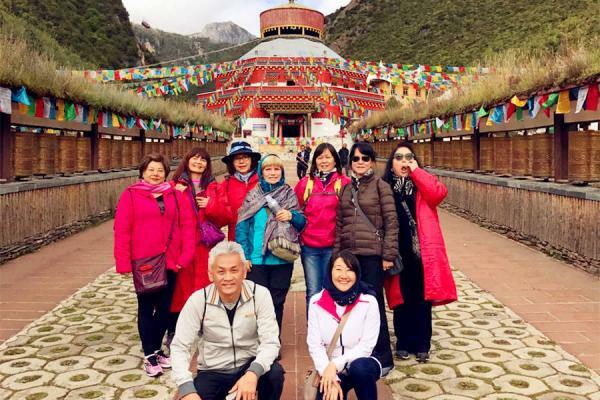 From then on, it was transformed into a formal Tibetan Buddhist Temple and became the national center of Lama affairs management. 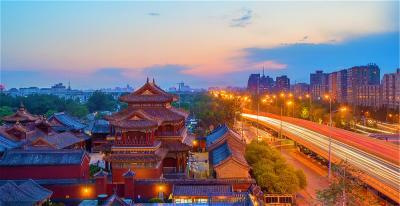 The Yonghe Lamasery faces south, and covers an area of 66400 square meters. 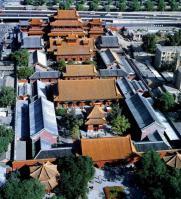 According to the statistics in 1950, there’re 661 rooms in total, including 238 Buddhist temples. The architectural style is very distinctive, which combines the ethnic arts of Han, Man, Meng, etc. The architectures of the whole lamasery are arranged along 3 roads – east, middle and west road, among which, the middle road is composed of several courtyards and halls as the central axis, and with various kinds of wing halls and wing buildings on both sides. 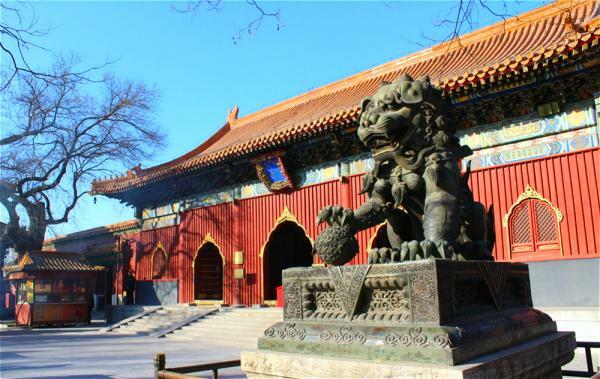 Along the central axis, there’re 5 main halls which are so magnificent and exquisite. It is originally the main entrance to the Yonghe Lamasery, and now is called Tianwang Hall (Hall of Heavenly Kings). 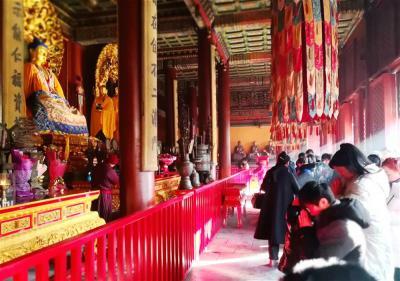 In the center of the hall, seated a statue of Maitreya Buddha, and on both sides of the hall stands the statues of the Four Heavenly Kings. It is the main building of the lamasery, which houses 3 nearly two meters tall bronze statues of the Buddhas of the Three Ages, i.e., Sakyamuni Buddha (Buddha of the Present) in the center, and Kasyapa Matanga (Buddha of the Past) and Maitreya Buddha (Buddha of the Future) on either side. It used to be the study and living room of Yongzheng Emperor when he was a prince. 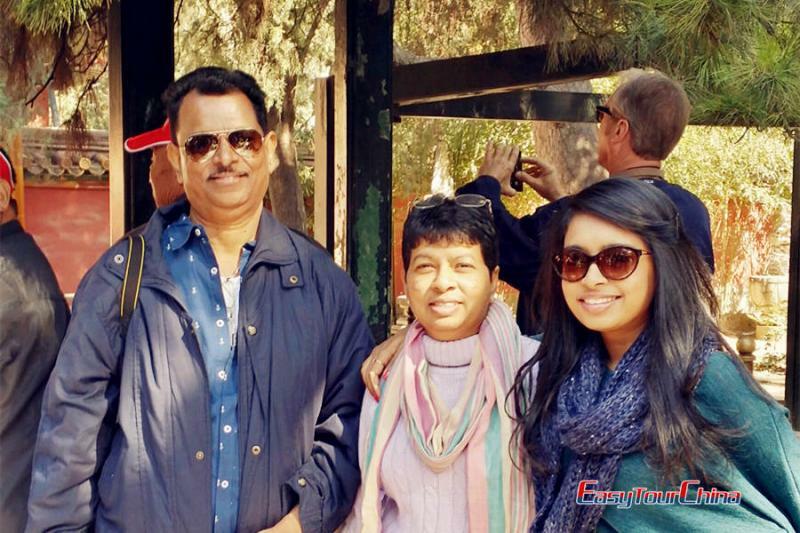 When he passed away, his coffin was placed here. 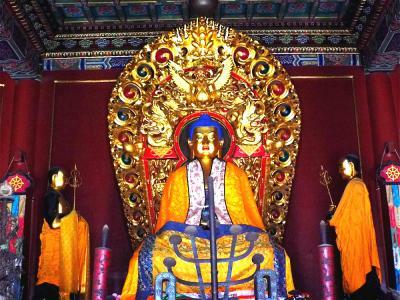 And now, three 2.35-meter-high carved sandal wood Buddha stand in this hall – the Amitabha (Infinite Life Buddha), the Medicine Buddha, and the Lion Buddha. It is a place for Lamas reading scriptures and holding Buddhist ceremonies. This hall is a blend of Tibetan and Han Nationalities architecture styles, which makes it so special. In the center of the hall seated a 6.1-meter-high bronze statue of Tsongkhapa, founder of the Yellow Sect of Tibetan Buddhism. 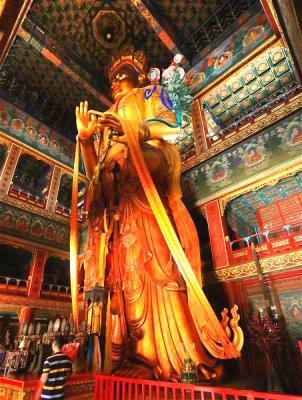 Behind this stature is an exquisite sandal-wood-carved 500 Arhats Mountain, which is 5 meters high, 3.5 meters long and 0.3 meters thick, containing 500 vivid and lifelike statures of the arhats made from five kinds of metals - gold, silver, copper, iron and tin. A carved wooden basin made of gold-rimmed nanmu is placed in front of this mountain. It is said to have been used for bathing Qianlong Emperor, when he was born for 3 days. There is an 18 meters tall (with 8 meters into the earth, which makes it 26 meters in total) and 8 meters wide statue of Maitreya Buddha in the Pavilion of Ten Thousand Happinesses. 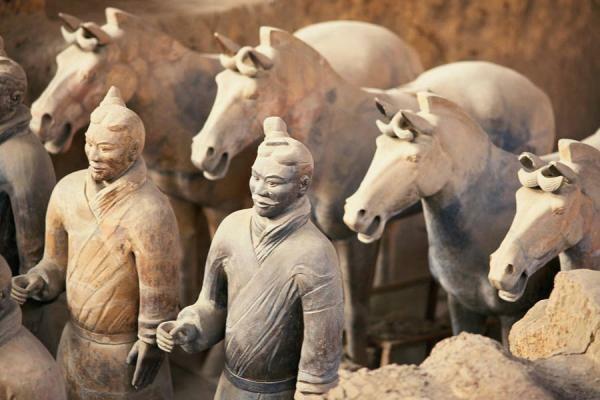 The entire statue is carved from a single piece of rare White Sandalwood. Another excellent woodcarving – the Gold-rimmed Nanmu Niche for Buddha in the east wing building (Zhaofo Builiding), is carved with 99 lifelike dragons. 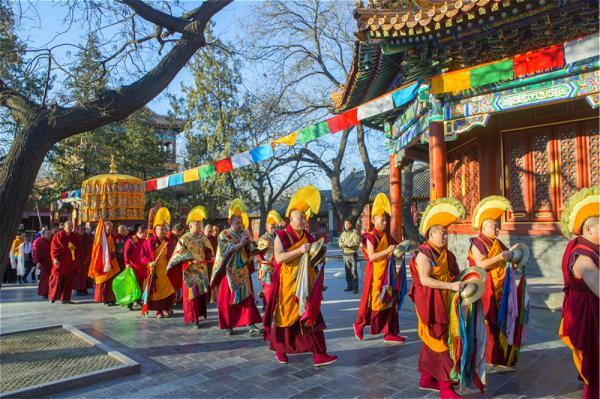 The Great Prayer Ceremonies (大愿祈祷法会) - held from the 23rd of the first lunar month to the 1st day of the second lunar month annually. 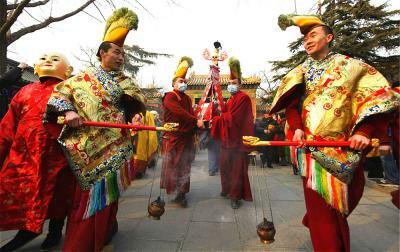 The Grand Ceremonies of Greeting the New Year (喜迎新年大法会) – held on the 1st day of the first lunar month annually. VCham (金刚驱魔神舞) – a Chinese Rama religion dance, which meant to drive away evil spirits and pray for good fortune and safety. The dancer will wear a mask of symbolic Tibetan Buddhism, and dance with the beat of ritual instruments. 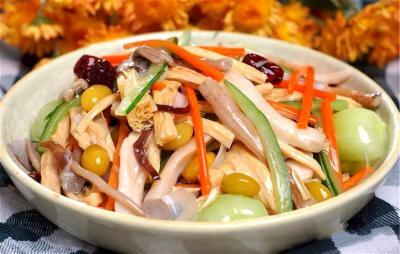 Lohan Vegetable (罗汉菜) – a Buddhist vegetarian dish that consist of various vegetables and other vegetarian ingredients such as day lily, agarics, tofu, mushrooms, winter bamboo shoots, Chinese cabbages, carrots, water chestnuts, etc. and a little vegetable oil. Location: No. 12 Yonghegong Street, Dongcheng District, Beijing. Take Subway Line 2 or 5, and get off at Yonghegong Station. Take Bus 13, 18, 44, 62, 75, 116, 684, 909, Special Line 12 or Special Line 2, and get off at Yonghegong Qiao Dong Station. Take Bus 13, 116, 117 or 684, and get off at Yonghegong Station. 1. Try to make it as a morning trip to avoid the massive crowd and to enjoy the scale and impact of the Yonghe Lamasery’s glory. 2. Recommended seasons for a visit: spring or autumn; recommended hours of a visit: 1-3 hours. 3. 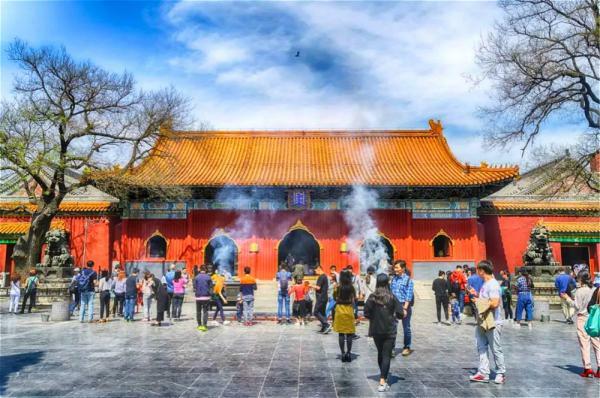 The incenses in Yonghe Lamasery are perfect, and purchase some special souvenirs at negotiated price will be a great idea.